For the first time in my life I am living close to sporting events where cheap tickets are sometimes available right up until game time. Unfortunately, I'm not that close, with Madison Square Garden about 45 minutes door to door, Barclays Center an hour, Prudential Center 90 minutes and Nassau Coliseum 2 hours. Yankee Stadium and Citi Field are both about 30 minutes away, which makes last minute purchases more likely once summer rolls around. Anyway, every day I monitor StubHub for that evening's events, looking for a bargain. If one appears, I snap it up; if not, I stay home and binge watch all the TV shows I missed while I lived overseas. Yesterday there were three games in the New York area: the Spurs were visiting the Brooklyn Nets while Alberta's two NHL teams were keeping the Rangers (Edmonton) and Islanders (Calgary) busy. 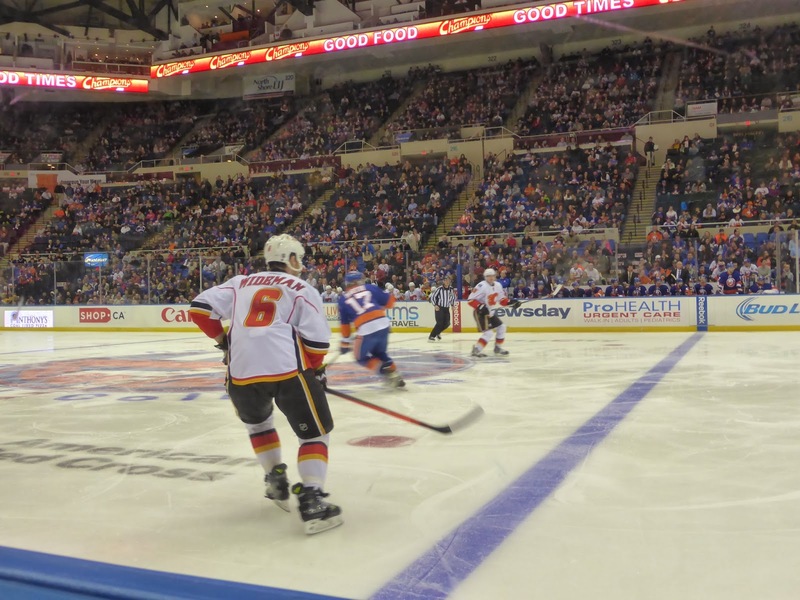 The Islanders always have cheap tickets available on StubHub, but the location of the Nassau Coliseum is so inconvenient that it usually isn't worth the hassle. Today, however, I found a single ticket in the first row for $20. That is crazy cheap for a seat next to the glass at an NHL game. Not only that, but tickets at the other two venues would cost as much if not more. Without much thought, I purchased the ticket and then began planning the route to the rink. There are two options: the first involves taking the Long Island Rail Road, which is not free (from my research, it looked like it would cost $19 round trip but don't quote me); the second option is to take a subway to Jamaica (not the country but an area of Queens) and then switch to the Nassau Inter-County Express (NICE) bus, which is free is you have an unlimited ride MetroCard. Obviously I chose the latter method, as it appeared to only be about 20 minutes longer according to Google Maps. Of course, Google Maps assumed one thing: accurate schedules. That was the big mistake. I left my place at 5 and had no problem getting to Jamaica on the F train, about an hour away. From there, I had to take to the n6X bus, an express to Hempstead Terminal, where I would catch the n70, n71, or n72 to the Coliseum. I missed one bus as it passed me as I exited the subway, and another zoomed by as I searched for the stop. No problem, I was still only a couple of minutes behind schedule, and when I caught the next bus, I thought all was fine. I arrived at Hempstead at 7 pm and joined the queue for the next rink-bound bus, which was scheduled to leave at 7:05. Being just ten minutes away, I figured I would miss about five minutes of the opening period. NICE had other ideas. Two buses pulled in, two bus drivers got out and told us "This bus is out of service" and the queue grew longer and more frustrated. I started to follow the game online, becoming angrier by the minute. By the time a bus departed a half-hour later, the first period was almost over. Let me just say that NICE is the biggest misnomer in the public transit industry. I feel for those who have to deal with that sort of garbage service on a daily basis. Schedules mean something in most places, here they are just wastes of paper. Anyway, after disembarking, I raced to the arena entrance, had my ticket scanned, and scampered to my seat, arriving just one minute before the second period began. The game was still scoreless, so I was thankful I hadn't missed much. This was the first time I had sat rinkside without a cheering interest. Two years ago I snagged seats next to the glass for Toronto's games in Edmonton and Calgary, and way back in the early 90s I had similar seats for a couple of Canuck games. Here I could finally relax and enjoy the contest up close. Scoreless midway through the second, the teams combined for 5 goals in 20 minutes, with the Flames taking a 3-2 lead on a weird goal that bounced in off of David Jones. 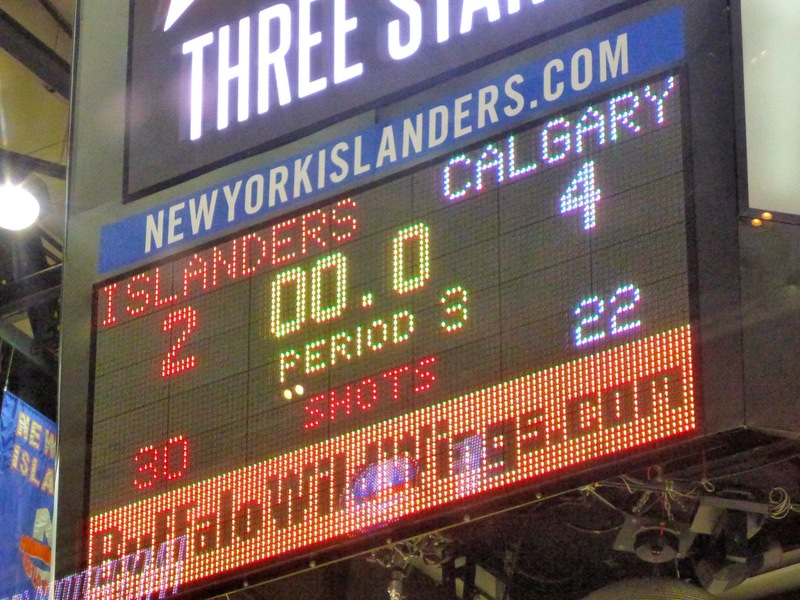 A late power play for the Islanders made it interesting but the Flames added an empty netter to win 4-2. The one thing that amazed me is how quickly the game passes when you sit so close. When I am far away at an NHL game, I find myself distracted at times, but here there were no distractions, even during the timeouts. Seeing the players and officials so close is really something that you cannot experience that often and I couldn't believe it when the second period was over. It was 35 minutes but seemed like 10. This is the view from my seat. Note that you can see the entire seating bowl across the rink. There is simply not a bad seat in the place, in fact, you could argue that the first row is the worst as it is right at ice level. My advice is to sit in the 200 section (row E or above) or low in the 300 level. Tickets on StubHub for these areas shouldn't be more than $10. 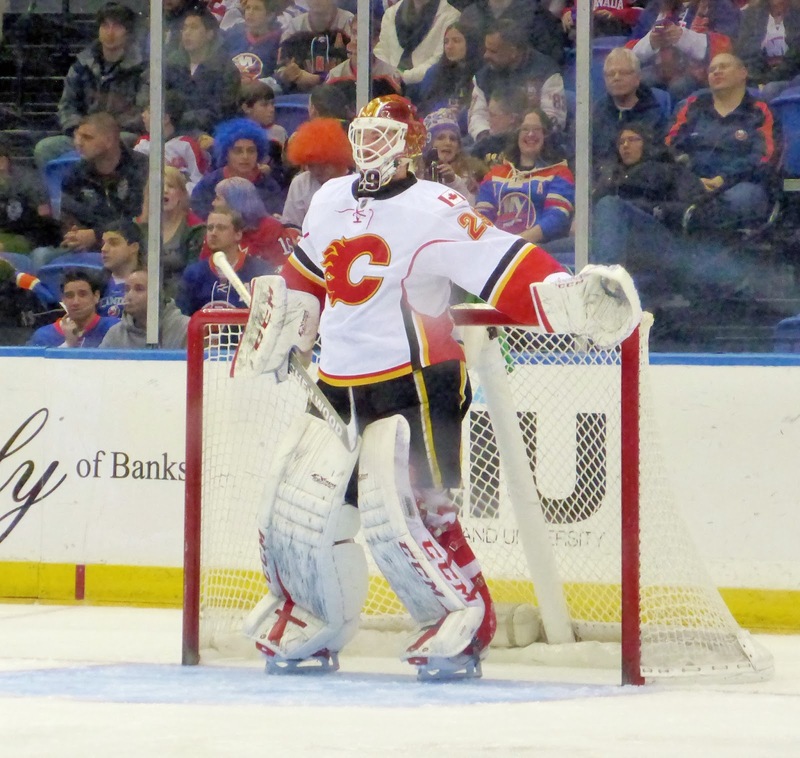 Reto Berra got the start for Calgary and was solid, stopping 28 of 30 shots directed his way. 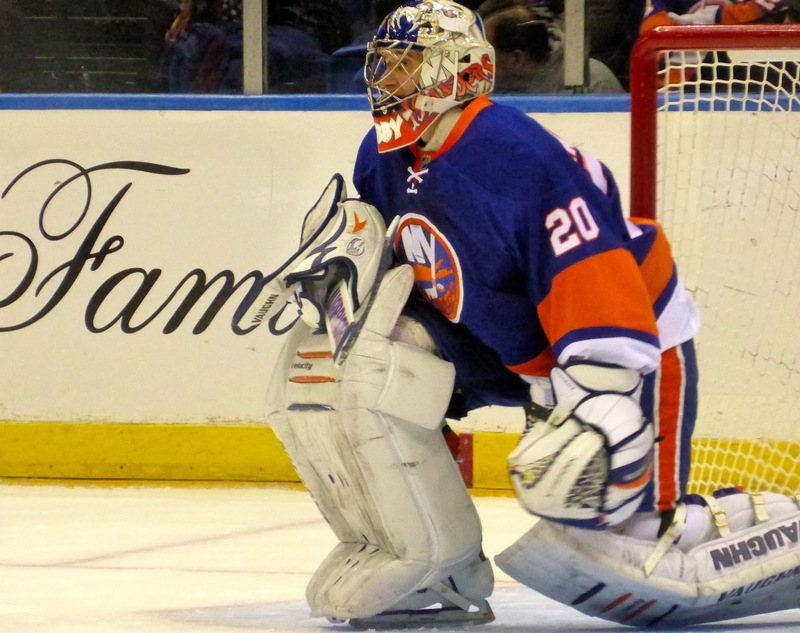 Meanwhile, Evgeni Nabokov manned the net for the home team, and did not fare well, allowing 3 goals on just 21 shots. 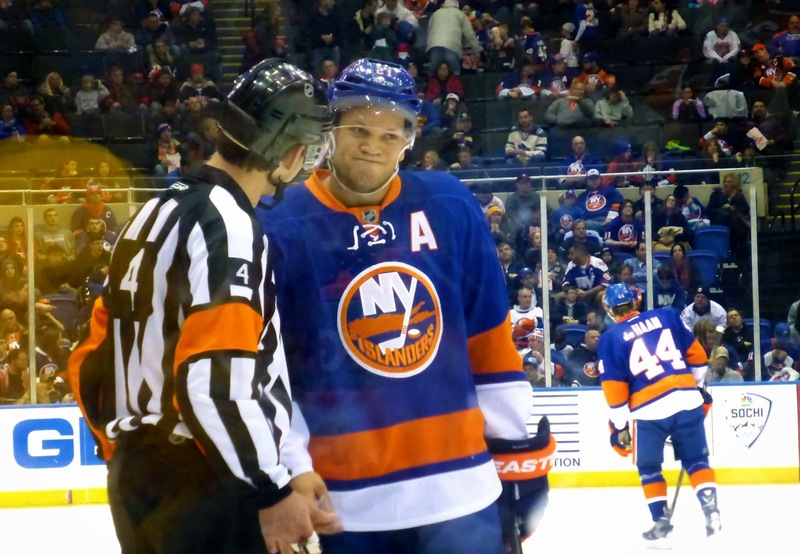 At one point, Islander assistant captain Kyle Okposo had a discussion with referee Wes McCauley and didn't seem to agree with what was being said. The team might want to put another ad in front of their bench. 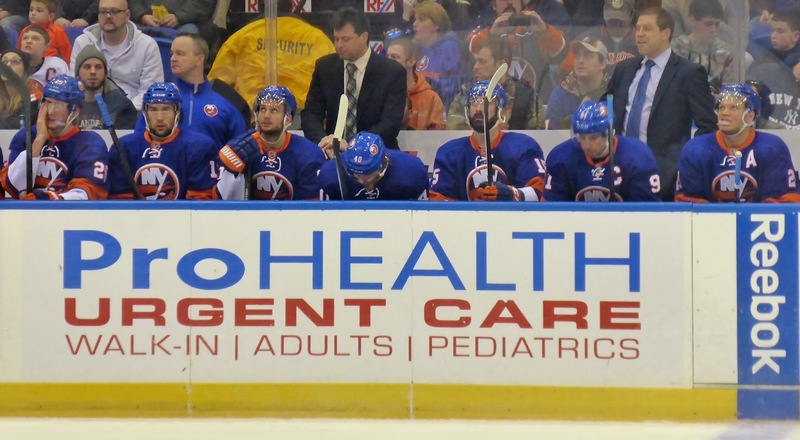 The Islanders certainly need urgent care though. 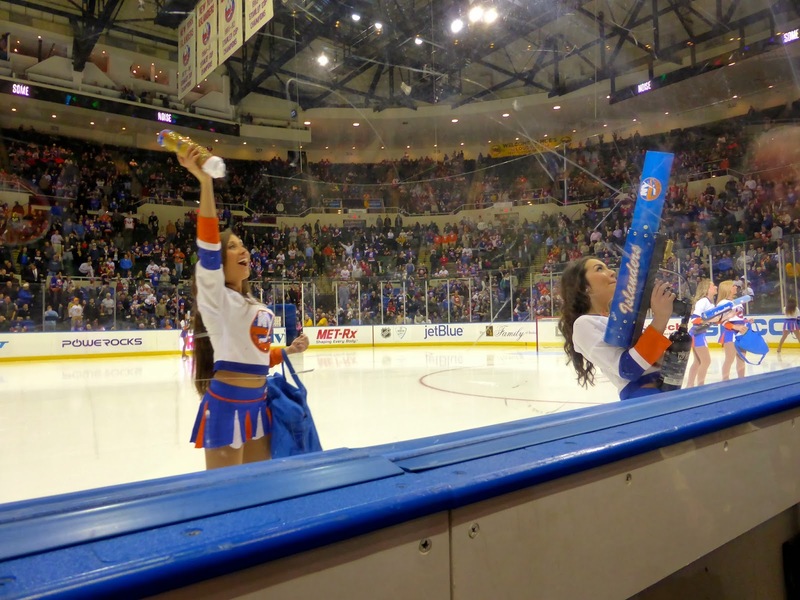 Another benefit of sitting so low is seeing the ice girls up close. Of course, you get no t-shirts here, so there are drawbacks as well. 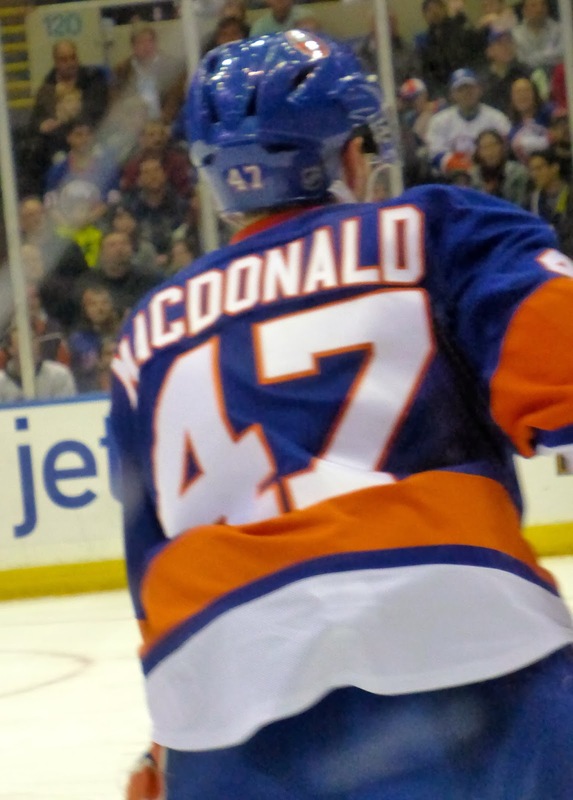 Finally, it is not often that you can see a player with your name and age on his jersey. The last time it happened was in 1980-81 when Blair MacDonald played for the Oilers. Still thinking I might buy one of these, it will be cool when the team moves to Brooklyn. I'm in Philadelphia for a rare tripleheader over two days with the NBA, NHL, and NLL all in action at Wells Fargo Center. I'll see the shorthanded Lakers, the Flames again, as well as the Edmonton Rush as Alberta continues its tour of the Northeast. Check back Sunday for a recap.